She has the voice of an angel, talent galore, is drop-dead gorgeous and she is a rising star on Canada’s opera scene. If she wasn’t so damn awesome, well… I’d still like her anyways. 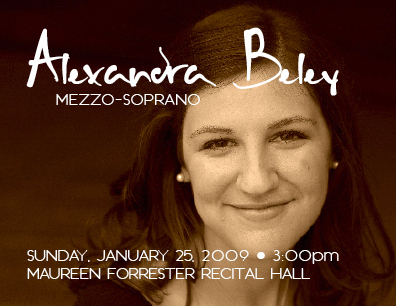 Mezzo-Soprano Alexandra Beley completed her Bachelor’s Degree in Music at Wilfrid Laurier University in 2009. Part of completing this program is to coordinate, promote and present a full-length solo recital of selected pieces, and she asked me to design posters for her event to post around campus. We did both landscape and portrait posters as well as mini-posters to make sure Alexandra’s face flooded every nook and cranny of the faculty. It’s pretty hard to toot my own horn when the subject matter is truly gorgeous to start with, but I think the posters turned out great and helped fill the Maureen Forrester Hall for this amazing recital. 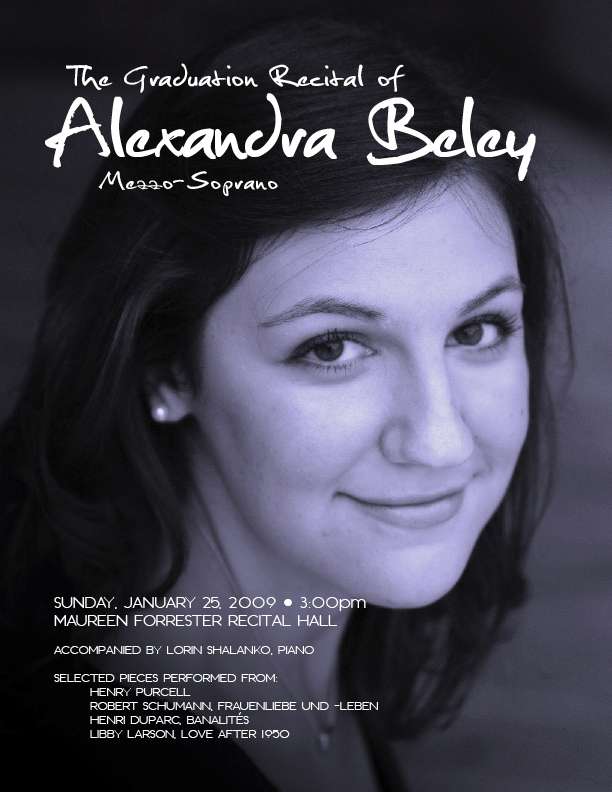 Since then, Alexandra completed her Masters Degree in Operatic Performance at the University of Toronto and is currently performing with the Calgary Opera as part of their Emerging Artists program – she is one of only eight hand-picked artists from across Canada to participate in this program! ← Art deco wedding – but no flappers please!